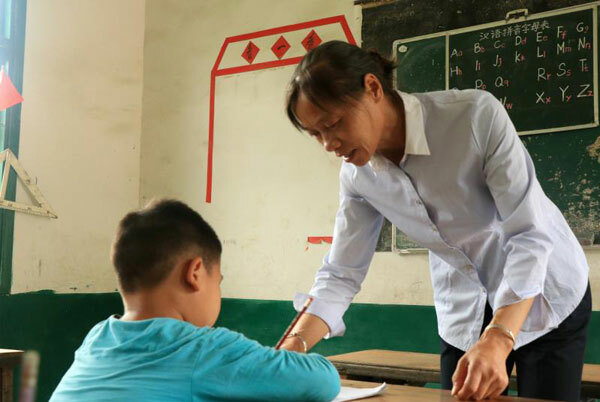 Yu Xiaoli, 54, is dedicated to her job as a teacher in Zongshujiao village, in the mountainous area of Central China's Hunan province, for 36 years. Yu, who was a fresh graduate at age 18, was assigned to the school in Zongshujiao village in 1981. The school offers courses for children in preschool, kindergarten, and grade 1 and grade 2, but has only four teachers. Yu teaches her students with love and patience and regards them as her own children, for 70 percent of the students are left-behind children who lack care. "Yu is not only the teacher to the kids but also their dearest 'mother'. We all trust her," said Yu Dongjin, Party secretary of Zongshujiao village. "Some young teachers once came here, but they left. Our village is far away from downtown and the transportation is not good here," Yu Dongjin said. Yu Rongping, is 13 years old but is in his first year at school. His parents are unable to speak and are poor, which meant he delayed starting school and suffered derision from his peers. Yu Xiaoli was concerned about the child and gave him extra lessons and helped remove his psychological obstacles. Yu now can read and count, and is gradually regaining his confidence. Her role is one that she's never thought of leaving. "I never thought about giving up my job. I stay here to teach the kids and help them get out of their impoverished situations. I want to keep company with these kids," Yu Xiaoli said. Yu Xiaoli, 54, is dedicated to her job as a teacher in Zongshujiao village for 36 years.